Lemon GreenTea: Dahil #MeronNaNgayon McSaver Meals! 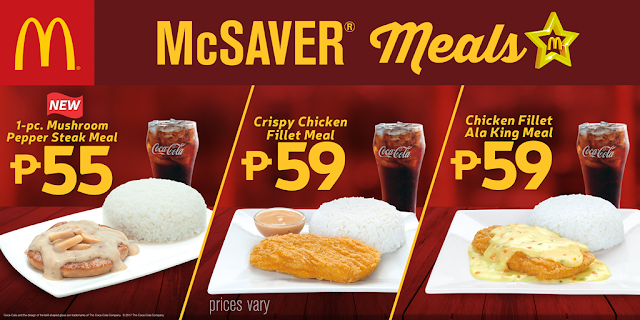 Life is so much better with things made available and convenient for anyone, just like the McDonald’s McSaver Meals, affordable meals complete with rice and drink starting at just P55! Choose from the golden Crispy Chicken Fillet Meal (P59), seasoned just right and served with gravy, the Chicken Fillet Ala King Meal (P59) served with a delicious, creamy sauce or the 1-pc. Mushroom Pepper Steak Meal (P55) made with a meaty patty, in creamy mushroom sauce and button mushroom slices. You can enjoy all these meals with rice and a regular drink. Now life is so much easier with McSaver Meals whenever you dine in at any McDonald’s restaurant nationwide. You can also have it via Drive-Thru, Take Out, or McDelivery by dialing 86-2-36, visiting mcdelivery.com.ph, or the McDo PH app. Try them and share your favorites by posting your photos online at facebook.com/McDo.ph and tagging @McDo_PH on Twitter or Instagram. Join the fun on Twitter as #MeronNaNgayon is already one of the top 10 trending topics in the Philippines.